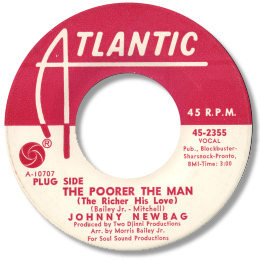 New York singer Newbag first recorded for Port in 1965, a record that has some firm admirers on the Northern scene. But although “Sweet Thing” is a pleasant enough big city beat ballad, it’s not wonderful, and “Little Samson” is simply too messy to work. But although one side of his Atlantic 45 doesn’t do much for me either, The Poorer The Man has an undeniable charm, particularly in the long spoken sections, and the melody is one that sticks in the mind long after the track has finished. Newbag has a slight lisp to his delivery and some uncertainty in the upper register, but that just adds to the overall appeal. A nice one.